So another give-away to celebrate my birthday month. I have decided today that i would give-away one of my favorite necklaces from my new shop Velvet feather. Inside the dome there are real lavender flower heads, they imitate the wonderful lavender smell, it is kind of like a hanging-perfume-bottle-pendant necklace. ella masters you can only enter once, either by twitter or blog comment (not both). can be a comment about anything really. It is open to international and uk residents. Please be aware that i will be going 4 give-away in the month of August and once they have all reached there deadlines, i will be doing a big announcement post at the end of August so the winner for each give away will then be announced, there can only be one winner for each prize. Previous Post a little drawing. Yeah the first to post a comment, yes!!! That necklace is absolutely beautiful!! What are great little Necklace Ella; I'm loving your new little vintage creations; I hope Velvet Feather goes well for you! Your creations are looking great at the moment so I have no doubts! Ooo enter me please 🙂 This necklace is gorgeous! Ella this is amazing, will you be making more of these then? They are wonderful. Please Enter me. It's my favourite too, cause I haven't seen anything like it before. That necklace is so pretty! Just like Phara said, I've never seen something like that before. Oh my gosh, it's stunning! Oh this is a lovely giveaway, the new shop is looking lovely as well! 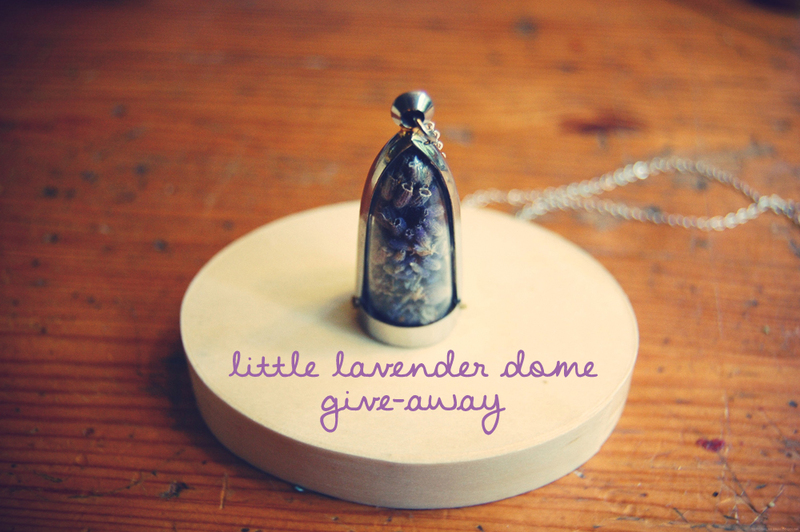 such a pretty necklace, please enter me! Lavender reminds me of South and summer, almost smell of the dreams 🙂 So I'd love to be entered. Yet another fantastic giveaway. I thought it was some sort of pine cone inside, but alas I was wrong…Its lavender. Love that necklace, please enter me! I follow you on both and have done for ages 😉 your blog and jewellery shop is one of my fav reads! You know I'm a huge fan of this range of necklaces! Would love to enter – count me in! I admire your handiwork :). It's so darling! I bet it has a faint lavender smell because it's encapsulated but lavender is just so fragrant.. and it's such a pretty necklace, ella! the necklace is gorgeous! i love lavender, it's so pretty. Mmmmm! Lavender! What an evocative smell… My holidays as a child in Norfolk and later on in France… It's so calming! I love that necklace! So cute! And I love your blog, would love to win this! beautiful ella, would love to win this! also swear i always have to re-follow you 🙁 must always get kicked off as a follower lol. I'd love to enter please ella! ooh, pretty, would love it! such a good idea!